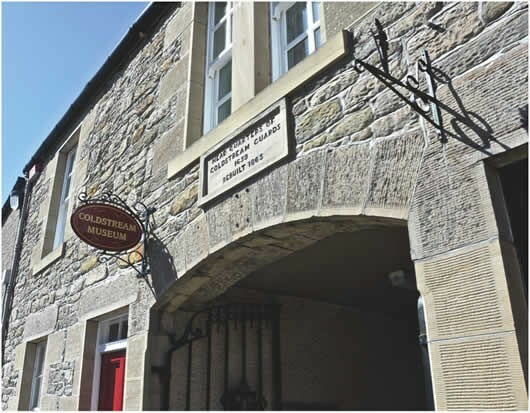 There are two Ecomuseum sites in Coldstream, the Museum and the ford at Tweed Green but the town has many other close links with the battle. The Cistercian Priory of Coldstream was founded in 1166 as a Nunnery and remained so until its dissolution in 1621. Throughout its history its location on the north bank of the Tweed kept the Priory intimately involved with the events of the various border conflicts. During the 1513 invasion of England the nuns would have witnessed the Scottish army crossing the Tweed no doubt recruiting local Coldstream soldiers en-route and after the battle the Prioress is said to have sent wagons to retrieve the dead from the battlefield. Today nothing remains of the Priory except a few fragments of stonework in Coldstream Museum, an Ecomuseum site. Today Coldstream commemorates the battle at a number of locations and by various annual events such as the Flodden Cavalcade. Coldstream Priory was founded by Cospatrick III, Earl of Dunbar, and his wife Derder, in 1165/66. It was founded as a nunnery and remained so until its dissolution in 1621. It was in the Diocese of St Andrews, the Arch-deaconry of Lothian, and the Deanery of the Merse, as well as being within the Earldom of Dunbar and Sherrifdom of Berwick-upon-Tweed. Nothing remains of the monastery, with the exception of some fragments in Coldstream Museum and indications on town plans and old maps. There are also street names and signs, from which one can assume that a religious house was in the vicinity. Examples include Abbey Road (formerly Abbey Lane), Nun’s Walk, Penitents Walk and Ladiesfield but whether these names are original, or are Victorian names, is unclear. However, it is documented that after the priory was secularised in 1621, it was in use as a quarry after its owner, Sir John Hamilton, had ‘allowed it to become dilapidated,’ the foundations of the Priory are probably still in situ. Various 19th century Ordinance Survey maps indicate the Priory was near the Marjoribanks burial site, and is marked on the 1864 plan of Coldstream, with a cross and designated ‘St Mary’s Abbey Chapel’. Abbey House and its grounds are without doubt in the grounds of the old Priory, overlooking what is now the Tweed Green at the mouth of Leet water. Many so-called histories of abbeys and religious houses concentrate on the buildings and architecture, with little emphasis on the people who lived there. Unfortunately in Coldstream today no substantial medieval buildings remain. In terms of the Battle of Flodden, Coldstream Priory’s role appears to have been in receiving some of the bodies of dead Scots nobles who are said to be buried in the grounds of the Priory. The remains of Scottish nobles were for the most part removed to Scotland in the days following the battle, by groups such as the nuns from the Coldstream Priory who travelled to the battlefield to offer care to the wounded and to retrieve the (important) dead. Unfortunately there is no record of which nobles ended their days here. Church: Access can be given to the church by telephoning either 01890-882685 or 01890-882661. Toilets & Baby Changing facilities. Wheelchair Access throughout public areas and Disabled Toilets. Indoor Children’s Play Area, Shop. LOCAL FACILITIES: Shops, Pubs and Accommodation. 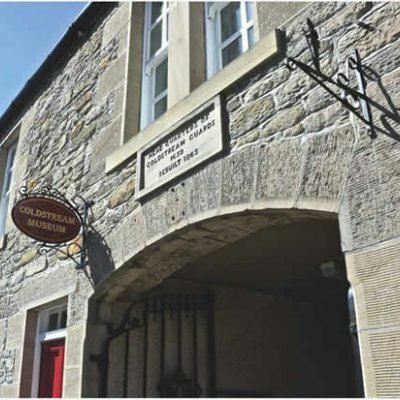 Coldstream Ford, Priory, Tweed Green Monument – parking is available in the Market Square. To the museum - turn down Market Street at the Newcastle Arms Hotel and follow the road down the hill for 100m. In Market Square, at the bottom the hill, follow the road left and the museum is on your left after 50m. Continue along the street and turn right at the end to access Tweed Green and Ford. The Flodden memorial is immediately to your right beside the flagpole.